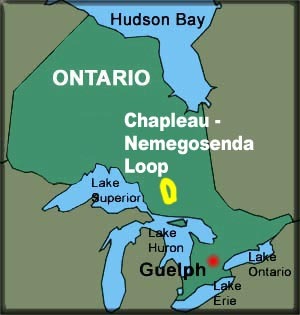 The Chapleau - Nemegosenda Loop is a drop and pool route, about 200 km long, with between 30 and 40 portages, depending on water levels. As well, it varies between river running and lake travel. We have included some videos. 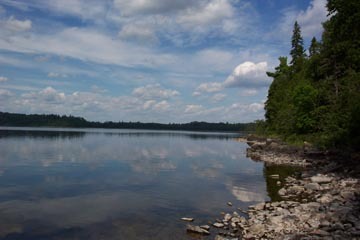 When we first planned the trip, we had intended to start and finish at Chapleau, but after talking to Regan at Missinaibi Headwaters Outfitters, we revised our plans to start at Racine Lake and finish at Westover Lake. 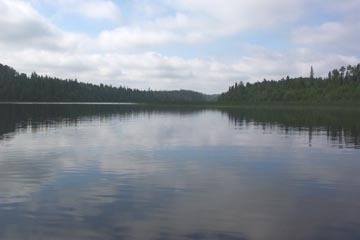 This would avoid the high boat traffic areas around Chapleau and an apparently brutal 1500m portage at the end of the trip. 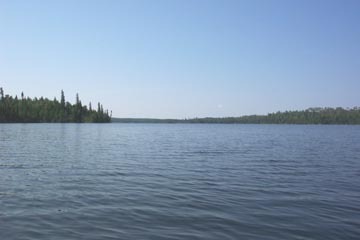 After camping overnight at Missinaibi Headwaters Camp, we started out across Racine Lake . . .
. . . and into Racine Creek, where there were two portages and a supposed liftover. Even though the water levels were low, we ran the liftover. 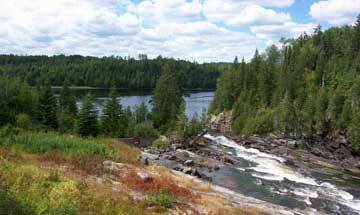 The portage into the Chapleau River had a steep end. 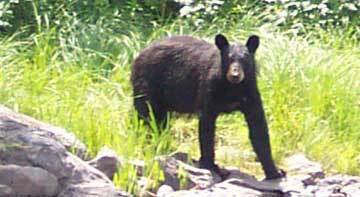 We had not been on the Chapleau River very long when we encountered a mother bear and cub on the shore. The cub shot up a nearby tree while the mother eyeballed us for quite a while. She finally went back into the bush and we continued on. The next 5 sets of rapids were run. Portages were not marked, but with low water, it was okay - a bit of bumping and grinding, though. 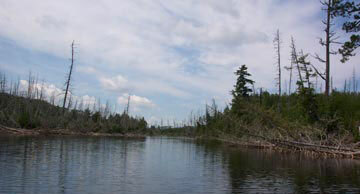 We were able to sail for about 5 km before pulling in at Island Rapids portage for the night. Although there is road access here, the area was quite clean. Our timing was good. 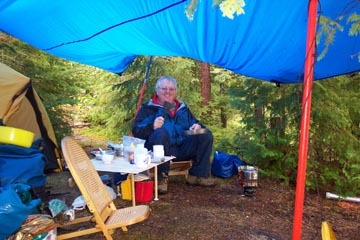 It started raining shortly after we put up the tarp & tent. The next portage was 700m, not 595m as the maps indicated. It was quite overgrown and had a lot of deadfall across the trail. 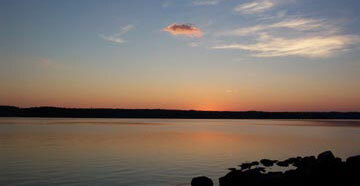 There are two outpost camps on Schewabik Lake. Other than those, there are no suitable campsite areas that we could see. We stopped at the outpost at the south end of the lake and used the flat spot next to the cabin for the night. It was a good choice because we would have had rain problems had we continued. 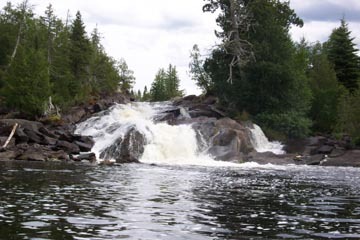 The portage out of Schewabik Lake is necessitated by a falls. The trail is very steep (almost a climb!) on both ends. It took a while to recover the resting heart rate after this one. 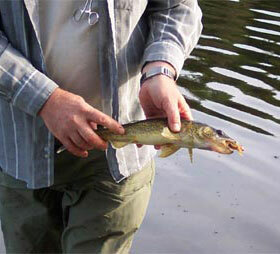 A walleye rewarded Dave for his efforts. Eagles, Canada Jays, Crested Flycatchers and Pictographs were spotted today. 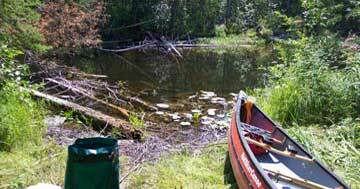 After stopping for lunch at Hemp's Camp on the south shore of Kapuskasing Lake, we sailed across the lake and pulled in at Elsas. 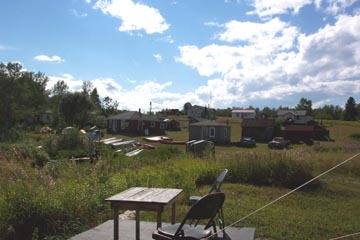 Elsas is an ex rail/logging town accessible only by plane, train or canoe. Shortly after we set up camp and had a hot shower at the Quigley's B & B, another type of shower went through with hailstones the size of your thumbnail! 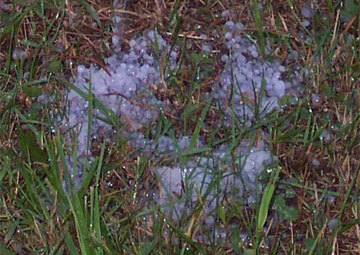 This photo doesn't really do the hail justice. Ron and Jeannie Quigley run the Bed and Breakfast mainly for canoeists and fishermen who come in on the train. They have a small pub/bar set up with cold beer. A bonus half way through our trip! 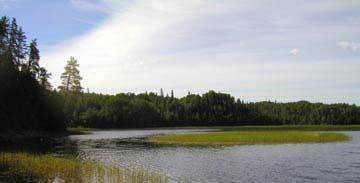 The Nemegosenda River is quite different from the Chapleau. We are travelling against the current, but it is not noticeable. Due to a lack of campsites along this section, we used the front 'lawns' of outposts as camps. The weather fluctuated between hot and wet. "The Chutes" is a major barrier to those who can't carry their boats over the portage. There is a fishing outpost camp here. In the logging days, logs were piled in the bay at the top of the picture to await spring breakup to transport them downstream to be milled. 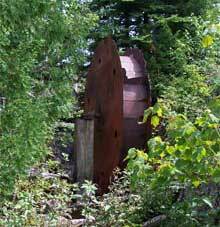 A waterwheel probably provided power to the operations here. With recent wet weather, and lack of maintenance, portages get overgrown. 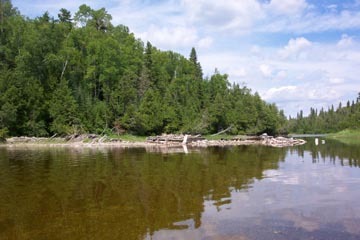 One of the many wider parts of the river is known locally as Grassy Lake. 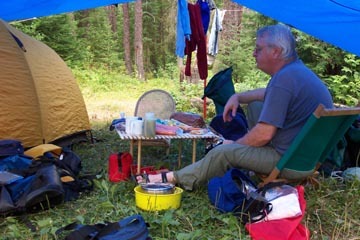 We camped at another outpost due to lack of campsites. This part of the Nemegosenda River was burned over a while back. Some of the large white pines survived. 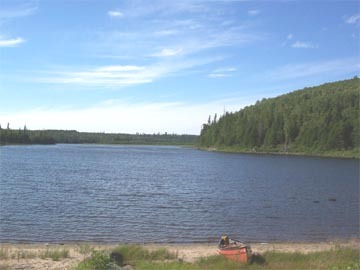 At the north end of Nemegosenda Lake, the remains of an old dam can be seen. The lake is long and can be rough if the wind is wrong. We happened to cross it on a great day. Glassy smooth! 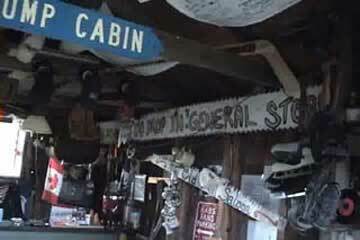 Another outpost lodge was used as a campsite. It was positioned well for a great sunset that night. There was only one campsite on the lake. We did not check it out since it was on an island and across the other side of the lake. 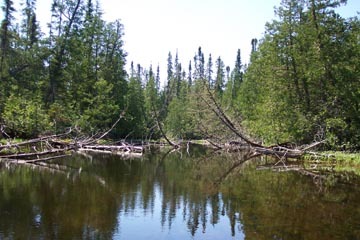 The 1000m portage out of Nemegosenda Lake started with a shallow silt filled area where we had to pull the canoe for about 50m, then lift it over a high beaver dam. 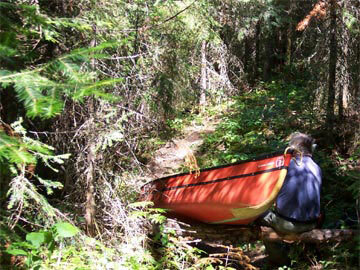 The actual portage started upstream about 100m and was quite muddy and very overgrown. 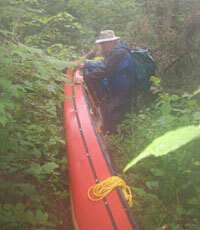 The photo shows the put in at the end of the portage. This part of the river was about 60 cm deep and we had to thread our way around fallen trees. The river grass was almost hypnotic in its movement. We had seen this stuff in the Wakimika River in Temagami a few years ago. Part of the way along this peaceful stretch of the river, we were going upstream and the breeze was in our face. We surprised a large bull moose which was standing on the shore. It bolted out of the bush right in front of us and headed upstream, away from us. After pausing for a look at us (we wondered if it would turn back towards us), it trotted up into the bush. What an incredible experience!! We got as far as Mate Lake and decided to pull out a day early. 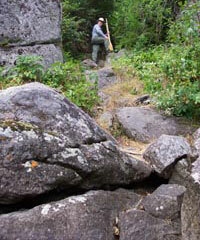 We were faced with a poorly marked 450m portage around a Dept. 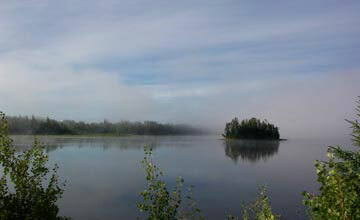 of Highways gravel pit and another shorter 125m portage to get about 2km more on the water. As well, the temperature was over 30oC. 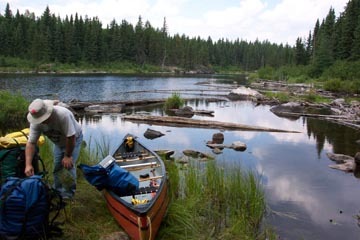 John, at Missinaibi Headwaters Outfitters, came and picked us up within a couple of hours. 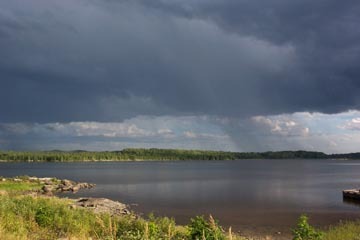 That night, we camped at Missinaibi Headwaters Outfitters Racine Lake location and shared our experience with them over supper and a few beers. Since this route is not routinely maintained, I am forwarding updated notes and maps to them for future use. All in all, a good trip!